The interesting thing about our group of friends is that we are drawn together by a love of a time period. The design, the music, the cars, the clothes of the 50s–60s. I know I have mentioned this before but what I may not have mentioned is that this group of vintage aficionados is actually a rag-tag crew of misfits, people who come from such diverse backgrounds that had we not been drawn together like moths to a vintage flame, it is entirely possible we would have lived our lives without knowing each other’s fabulous company. Our social group contains designers, photographers, singers, sailors, dentists, mechanics, IT nerds, researchers, stylists, performers, sculptures, educators, electricians, retailers, production managers, the list goes on. Had I not become inspired by Gil Elvgren’s pin up girl artworks and rockabilly music I may never had seen Royal Crown Revue at the Metro in 2001 and may never have met SAH (I say may, because it turned out we were going to the same design school, so we would have probably crossed paths eventually). Had our friend Robyn never reignited her love of rockabilly music and attended a dance class many years ago, she may never have met Georgio – and their wedding last month may never have happened. But they did meet and in front of an intimate group of friends and family they declared their love and commitment to one another. Last year the happy couple asked me to design their wedding stationery. 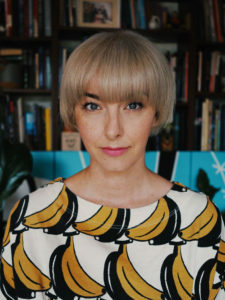 Robyn’s brief was open: simple, stylish, no love hearts or wedding schmultz. Guest should think ‘a night at the Phoenix club Palm Springs’ when they viewed the invite. So I came up with an elaborate 6 panel, roll fold, long and narrow design. The illustrations were 2 colour but highly intricate and multitoned. It was extravagant and fabulous. Unfortunately it was a little too extravagant as, although my clients R & G where very happy with it, I had a hard time finding the right printing style that would give me the finish I wanted that was also in our budget. I looked at screen printing, letterpress, lithographic and offset press but all of them struggled to fit the constraints of the brief. So it was Daniel at Posterboy printing that came to my rescue! 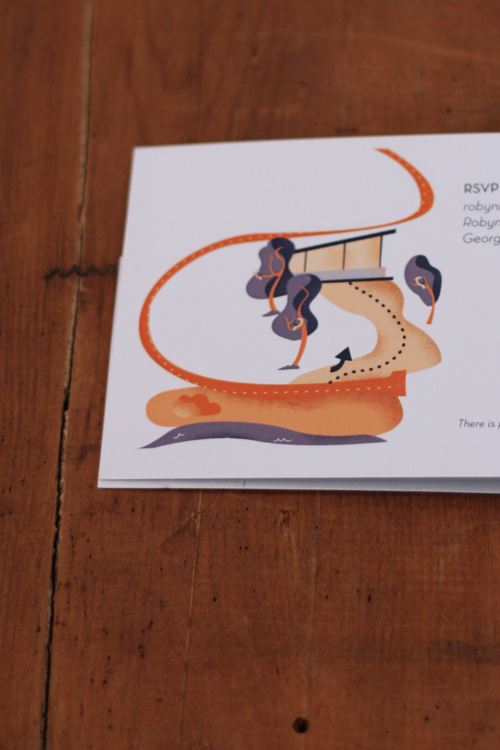 I had ruled out digital printing from day one as I really wanted the ink to seep into a thick textured stock and digital just sits on the top of a stock and is shiney – no thanks. But Daniel’s wonderful hi res digital printer was able to get a more than acceptable result. He even hooked me up with his paper supplier so I could hand pick the stock – I wanted thicker paper with a soft texture like watercolour paper and we got it! In the end I altered the design to be a 4 panel folded (slightly narrow) DL size, the only thing I couldn’t compromise on was the die-cut on the front of the card. That was non-negotiable and since we couldn’t afford to get a professional knife made up to cut the holes I ended up making my own die-template and hand cutting 100 invites myself. It was time consuming and laborious but completely worth it. Both R and SAH offered to help but I just couldn’t relinquish the scalpel! Each corner had to be perfect and exact, with no fluffy bits or over cuts. And each line had to be completely straight with no wobbles – yeah I was a bit obsessed and yeah it took a few days to do it all but it was totally worth it! The concept behind the design was inspired by Palm Springs mid-century modern houses as well as R & G’s newly acquired house. 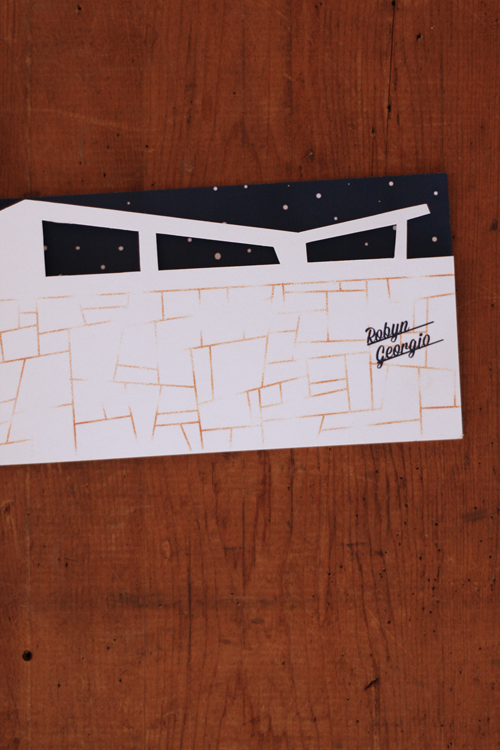 The roof line and windows are cut out on the front of the card, revealing the dusky night sky in the desert. 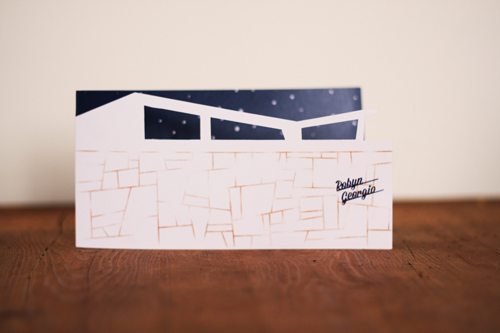 When you open the card the inside presents the house interior behind the roof line, with a hint of a soiree underway. I included personal touches like the family of Kookaburra’s that live in the trees on R & G’s property. 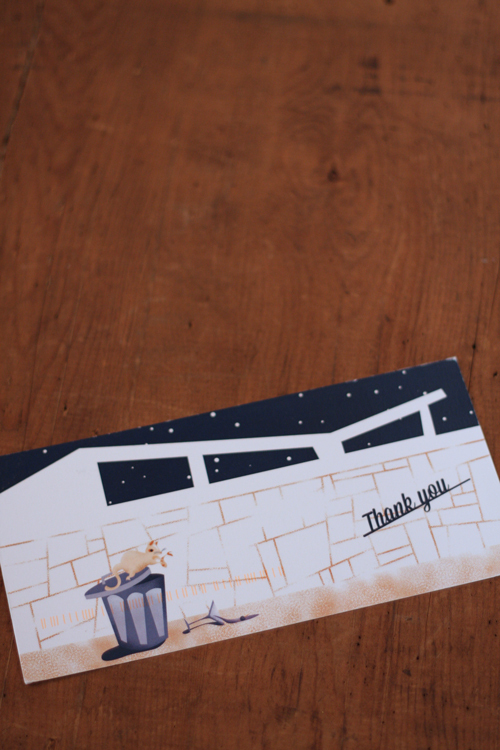 And Mrs Possum made an appearance on the Thank you postcard – gate crashing the party as she does most evenings. 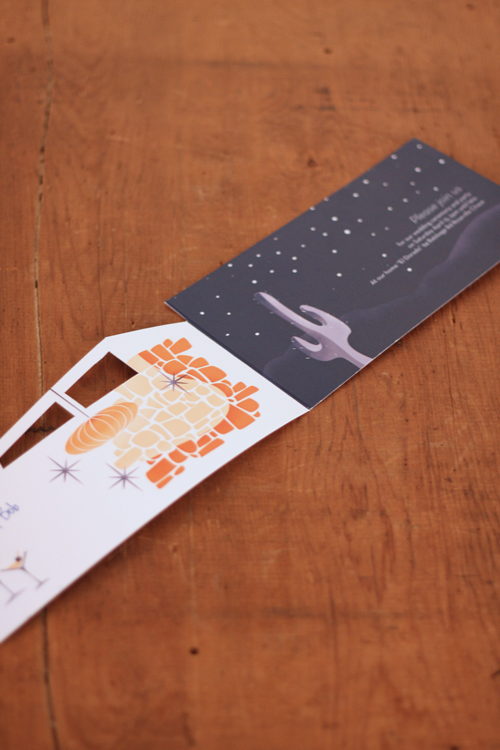 This brief was both creatively challenging and a little overwhelming – an open brief but a very design savvy client. I am really happy with the result (as are the clients) and am glad I pushed myself in this brief. It really helped lift remnants of that ‘baby fog’ that’s been hanging around for far too long. As well as giving me a chance to stretch my illustration legs and chase paper and printers, which is something I don’t get a lot of opportunity to do working with books.